We will alternate in class between lab assignments and problem sets. There are lecture videos and reading assignments prior to class. It is your reponsibility to keep up with the course reading and lectures so that we can spend class time working on building stuff. Note that each class day will have the in-class assignments as well as any reading/lectures to watch. Introduction to equipment, soldering exercise, and pendulum lab. Today will be the kickoff for the class and we will get you started with the lab equipment. You will build your own power connector that you will use throughout the course. Solderless breadboard power connector instructions. 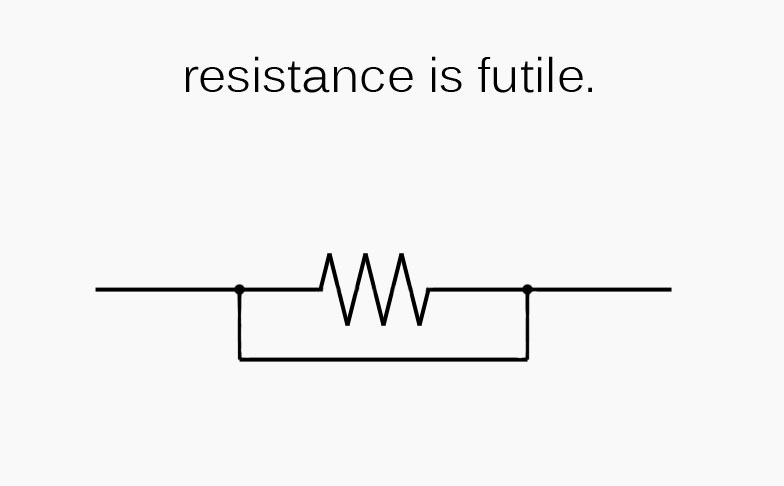 Introduction to resistors. You should come to class prepared by reading and watching the videos. Today we will experiment with some simple resistor circuits and compare the predictions to observations. Today we will use a thermistor (temperature sensitive resitor) to measure temperature of a cooling cup of hot water. Read chapter 2.3 onwards, prior to class. More resistors. Today we will do more resistor circuit analysis and simple experiments. Today you will build a scale using a strain gauge. We will use our first integrated circuit, the instrumentation amplifier. Today we will introduce the capacitor. You should come to class prepared by reading and watching the lectures. Today we will just explore the basic nature of capacitor circuits. Read chapter 3 prior to class. Capacitance video lecture - watch prior to class. Humidity. Today we will build a circuit to measure capacitance and use that principle to construct a humidity meter. Introduction to the Bode plot. You should come to class prepared by reading and watching the lecture. Today will be the first time we discuss the Bode plot, a concept we will use for the remainder of the course. Read chapter 4 prior to class. RC circuits and Bode plots video lecture - Watch prior to class. Bode plots In class assignment. EKG. Today you will hook yourself up to electrodes and build a working EKG. Mode Bode plots. Today we will look at the Bode plot and analysis fo filters in series. More Bode plots In class assignment (alternative version). Blood pressure. Today you will build a circuit to measure yout blood pressure. Blood pressure lab assignment (original version). Blood pressure lab assignment (alternative version). Op-amp introduction. You should come to class prepared by reading and watching the lecture. Today we will explore the behavior of the op-amp. Read through chapter 5.7 prior to class. Introduction to op-amps video lecture - Watch prior to class. Op-amps In class assignment (original version). Op-amps In class assignment (alternative version). Source meter. Using op-amps we will build a device which can set the voltage across and measure the current through a device (or vice-versa). Source meter lab assignment (original version). Source meter lab assignment (alternative version). More op-amps. Today we will explore more op-amp applications. Read remainder of Chapter 5. Pulse oximeter. Today we will use light shining through your finger to measure your pulse. This component is the first part of building a working pulse oximeter. Light lab assignment (original version). Light lab assignment (alternative version). Complex numbers. You should come to class prepared by doing the reading and watching the lectures. Today we will introduce the idea of using complex numbers to analyze circuits. Read up through Chapter 6.6 prior to class. Introduction to complex numbers video lecture. Watch prior to class. Complex, time dependent video lecture. Watch prior to class. Complex numbers in class assignment (original version). Complex numbers in class assignment (alternative version). Ballistocardiograph. This experiment shows how we can pick up your heart rate by standing on a bathroom scale. BCG lab assignment (original version). BCG lab assignment (alternative version). Complex impedance. Today we will introduce the idea of impedance which dramatically simplifies the analysis of circuits with capacitors in them. Read chapter 6.7 and onwards prior to class. Complex impedance video lecture. Watch prior to class. Anlysis of filters with Complex impedance. in class assignment. Ultrasonic range finder. Today you will transmit and receive an ultrasonic pulse. The time delay between transmit and receive provides a measure of the distance to an object. Ultrasonic range finder lab assignment (original version). Ultrasonic range finder lab assignment (alternative version).